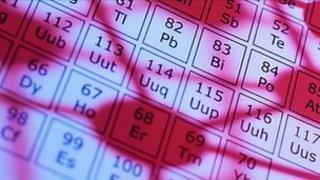 Scientists have presented new evidence for the existence of an unconfirmed element with atomic number 115. The element is highly radioactive and exists for less than a second before decaying into lighter atoms. First proposed by Russian scientists in 2004, the super-heavy element has yet to be verified by the governing body of chemistry and physics. The new evidence by a Swedish team is published in the journal Physical Review Letters. "This was a very successful experiment and is one of the most important in the field in recent years", said Dirk Rudolph, professor at the division of atomic physics at Lund University, who led the research. After the discovery of element 115, independent confirmation to measure the exact proton number was required, Prof Rudolph told BBC News. He said the finding "goes beyond the standard measurement" which had been observed previously. A new isotope of a potential new element was produced, which transformed into other particles via a radioactive process named alpha decay. The researchers also gained access to data that they say gives them a deeper insight into the structure and properties of super-heavy atomic nuclei. The team bombarded a thin film of the element americium with calcium ions, which allowed them to measure photons in connection with the new element's alpha decay. Certain energies of the photons (light particles) agreed with the expected energies for X-ray radiation, which acts as a "fingerprint" of a given element. The experiment was conducted at the GSI research facility in Germany, where scientists have previously discovered six other new elements. The potential new element will now be reviewed by a committee which consists of members of the international unions of pure and applied physics and chemistry. They will decide whether to recommend further experiments before the discovery of the new element is acknowledged.